I gave baking lessons to Joy and Steve’s children, Bambi and Summer today. They enjoyed the batter so much, they kept swiping to have a taste. 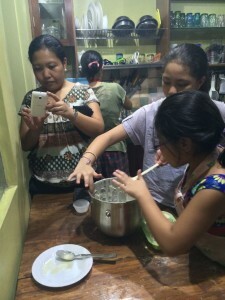 Joy taking pictures of Bambi and Summer cleaning out the batter from the bowl. I hope they come by again, it was fun teaching them. Reggie and I had dinner in Makati afterwards. 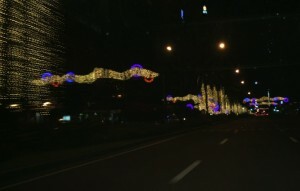 On the way home, I had to take pictures of the lights on Ayala Avenue. Having a mount for my iPhone on the dash helped take the pictures. I will have to adjust the mount though, I had to crop Reggie’s picture to hide the mount arm. Reggie took this one. Cool motion shot. 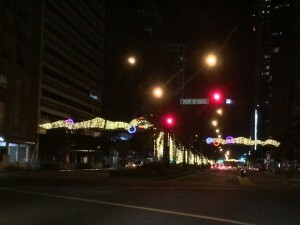 At the corner of Ayala Avenue and Paseo de Roxas waiting for the light to change. Lots visually of interesting things happen on the road. I am seriously considering a dashboard camera to make life easier.